Fair warning- you're about to enter 'spooky' territory. Now, while Shawn is a big believer in the supernatural (I think he has watched The X-Files too many times...), it's fair to say that while I'm certainly not a non-believer, I'm not as in tune with supernatural occurrences as he seems to me. Though, ghosts and aliens aside, I definitely believe that strange and unexplainable things do sometimes occur. In fact, we recently had proof of this. On Thursday I came home from work and Shawn asked me if I had hidden any Hershey's Kisses around the apartment. As you can imagine, this was quite a baffling question as it seemed to have come out of thin air. Of course I hadn't hidden any Kisses anywhere... I couldn't even remember the last time I bought Hershey's Kisses! They are just not my chocolate of choice. Why would he ask me such a preposterous question?! 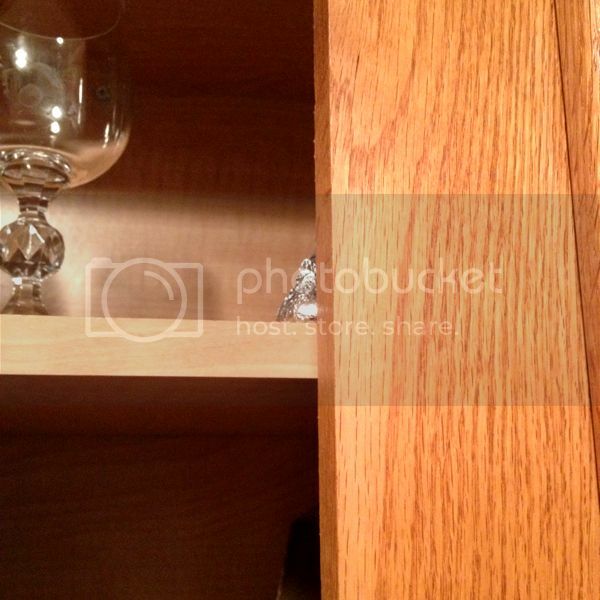 Why yes, that is indeed a Hershey's Kiss slyly hiding behind the center bracket of the cabinet... but, how exactly did it get there? That is the part we can't even come close to explaining. I had cleaned the interiors of all of the cabinets when we first moved in, so it's not from the previous renters. We asked all of our recent visitors if they were playing a weird prank on us, but no one owned up to it. And as far as we know (and hope) no one else has been inside the apartment recently... it's as though the Kiss appeared out of thin air! The only other explanation would be that Lloyd put it there, but that sounds even more ridiculous. I found Hershey Kisses all over my apartment once and the cat did it. But they were not hidden inside any cabinets. They were all over the floor and in the couch/bed, etc. I had a handful or so left over from Christmas presents and I threw them in a glass jar on the counter shelf over the kitchen sink and forgot about them. Apparently, Remington (cat) got bored one day, decided to be naughty and jumped on the counters and then went insane over the smell of the kisses. If they are not sealed up and in the refridge he will hunt them out and goes all insane (like catnip). Not sure what to make of your Hershey Kiss find. It's a bit creepy and a bit cool. =) Hopefully Lloyd is a way more crafty than we've all given him credit for. Although, there are worse things that could have been left hidden to find.